Vascular system covers a whole network of vessels that carry blood with oxygen from heart to all other parts of the body.Vascular system comprise of both arteries and veins. Vascular system covers a whole network of vessels that carry blood with oxygen from heart to all other parts of the body.Vascular system comprise of both arteries and veins. Arteries supply the blood from the heart to other parts of the body. Veins are responsible to return it. Vascular system also consists of lymph vessels and lymph nodes that are a part of the cleaning system that are known to remove the damaged cells from the body. Lymph vessels protect your body from infections and chronic diseases like cancers. When the vascular network gets disturbed it is considered as vascular disease or vascular problems. The vascular diseases can range from mild to chronic. The vascular disease generally affects the flow of blood. The disorder can be in the arteries, veins and vessels that carry the blood. In mild cases, ischemia is usually observed where enough blood is not supplied to the specific organs. In severe cases the vascular diseases can lead to life-threatening problems like heart attack. Vascular diseases are classified into different categories based on the location and condition of the disease. Peripheral vascular disease is a circulation disorder that mainly affects the blood vessels outside the heart and brain. In this disease the blood vessels are narrowed and this narrowing is caused due to formation of plaques around the vessel. 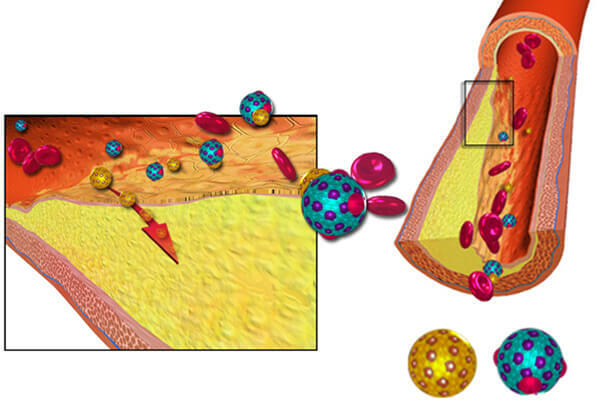 Accumulation of fat and cholesterol deposits in the arteries is referred to as plaque. The condition of plaque formation in the vessels is referred to as arteriosclerosis. Plaque formation generally decreases the amount of blood and oxygen that is supplied to arms and legs. The swelling or bulging of a blood vessel wall is condition referred to as aneurysm. The bulgy appearance is most commonly seen in the aorta. Aorta is the main blood vessel leaving the heart. Small aneurysm in the body does not pose a high risk and is not life threatening. Small aneurysm can increase the risk of other diseases. Generally when people are excited or in extreme cold conditions the small arteries of fingers and toes twitch or may cramp. This sudden twitching and cramping can temporarily stops the blood supply in that area. This condition is referred to as raynaudÃ¢â‚¬â„¢s phenomenon. Buergers disease is very rare type of disease that affects mostly the small and medium sized arteries and veins in hands and legs. It is a very rare form disorder where the veins swells up and gets blocked by clots. Veins contain flaps for opening and closing. When your muscles contract, the valves open and releases the blood. When your muscles relax the valves are closed for the blood to move in one direction. When the valves are damaged, the valves cannot close completely and thus the blood flow in both directions. A varicose vein is a condition where the valves bulges like reddish purple ropes under the skin. Lymphatic system depends on the muscle contractions and the valves in the vessels to keep the lymph moving. In absence of vessels and nodes the fluid accumulates and swelling is seen. This condition is generally seen in arms or legs and is called lymphedema. Vascular disease treatment is necessary to avoid any life threatening disorder. In many vascular diseases, often endovascular surgery is required to treat vascular diseases. Dr. Abhilash Sandhyala is one of the best vascular surgeon in Hyderabad. Dr. Abhilash is an efficient and a successful endovascular surgeon in Hyderabad. Endovascular surgeries can be performed to treat vascular diseases. It is the safest and minimally invasive endovascular surgery with highest success rates.